#FairfieldCountyGives on Giving Day TODAY! It's Here! The 24-hour giving marathon that can be a game-changer for our little rescue. The deal is to get as MANY UNIQUE DONATIONS (that means one donation per person) of $10 or more over a single day-Thursday, March 9, 2017. The non-profit in Fairfield County who gets the MOST UNIQUE DONATIONS WINS $20,000! Read more about #FairfieldCountyGives on Giving Day TODAY! Our President to Speak at Cat Camp NYC! Cat Camp is March 11-12 at the Metropolitan Pavilion, 125 West 18th Street New York, NY 10011, from 11 AM to 7 PM each day. It will bring cat lovers together under one roof to celebrate all things cat and to discuss some of the most important and challenging problems facing cats today. Exhibitors will hail from around the country and there will be several adoption events and fairs taking place throughout the weekend. There will also be special presentations including a keynote message by The Cat Daddy, Jackson Galaxy (My Cat from Hell and the Jackson Galaxy Foundation); Lil Bub (with a presentation by Bub and Mike Bridavsky); NYC Feral Cat Initiative; Kate Benjamin (Hauspanther); and other notable personalities. ©2012 Robin AF Olson. Fred. For full info on tickets visit the Cat Camp website. Read more about Our President to Speak at Cat Camp NYC! Be Part of Our Rescue Mission: The Feral50. Kitten Associates was founded to help cats and kittens who are in dire situations, like high-kill shelters on "death row" or facing a tough life on the streets. We're a small organization but we always help cats and people however we can. 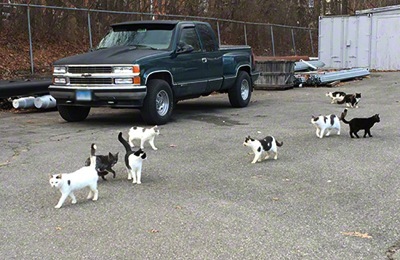 Two weeks ago we learned that there was a huge feral cat colony in neighboring Waterbury, CT. There were estimates of it ranging from 43 to over 60 cats. It's winter and we're taking our first "break" from rescue in six years, but with this news we decided not to relax and hope someone else would help these cats. ©2017 Robin AF Olson. Waterbury1 is now recovering from surgery to remove all of her infected teeth. We've teamed up with a number of rescues, trappers and other volunteers to help raise funds, trap cats, get injured or sick ones treatment, get them ALL spayed/neutered, and relocate friendly or young cats into rescues to find forever homes. It's an unbelievably complicated, difficult process run by people who have never worked together before. Everyone is working very hard but we can't do this without the financial support of our community. To date we have already TNR'd (Trap, neutered, returned), 10 cats. Of those 10, 1, nicknamed Waterbury1, was so sick with a horrific gum infection, that she was near death when we rescued her. She got the care she needed and is being adopted into a loving home. 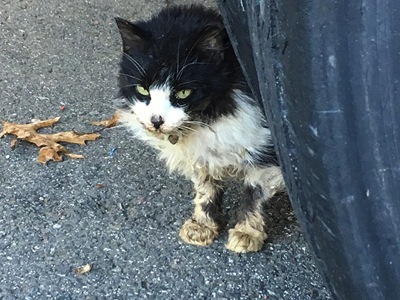 Some of the cats appear to be abandoned strays, and others, who are truly feral, will be returned or we will carefully relocate them to barn homes. Every cat will be tended to, vetted and as many as possible will be placed into rescue to find a loving forever home if that's what is best for them. ©2017 Robin AF Olson. Just some of the many Feral50 cats. • FUNDS to provide Spay/Neuter can be directed to Nutmeg Clinic. Please add a note with your donation that the funds go to "Kitten Associates/Feral50"
• FUNDS to provide VET CARE beyond simple spays/neuters. Some cats have upper respiratory tract infections. One has a limp that needs tending to and others may have worse injuries or illness. 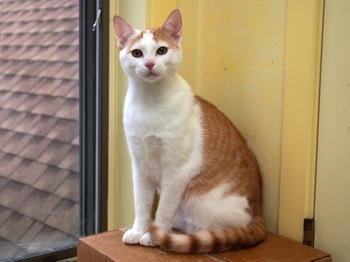 We just raised $1400 for Waterbury1, but we have nothing left for any other cats who need help. Use the "DONATE TODAY" button on the right side of our main page or visit our DONATE PAGE. Either way please add a note "Feral50" with your donation so we'll direct the funds appropriately. You can also mail a check to: Kitten Associates, P.O. Box 354, Newtown, CT 06470-0354 Put a note on the check "Feral50". Kitten Associates is a 501c3 non-profit so your donation is tax deductible. If you want to be part of this rescue mission, please contact us at info@kittenassociates.org. THANK YOU! UPDATE: 2/7/17 to date we have trapped 32 cats. Some were very sick and are getting care. A few are friendly and we're finding homes for those kitties. We still have a long way to go and still are in dire need of help to move two feral shelters from Newtown, CT to Waterbury (just one trip with a pickup). We also need funds and help transporting trapped cats to Nutmeg Clinic in Stratford, CT from either Waterbury or possibly Newtown. Please contact us at the email addrss above if you'd like to be part of our rescue mission! Read more about Be Part of Our Rescue Mission: The Feral50.